I had an interesting conversation recently about how I thought Beautiful Jim Key was “educated” or trained to exhibit his remarkable skills. I was asked if I believe that Jim learned the way a child would learn, or if I thought there might have been some undetected cues from Doc. Since Step Right Up: How Doc and Jim Key Taught the World About Kindness contains an Afterward, rather than an author’s note, there was no space for me to expand on my beliefs about Jim’s skills, so I thought I’d broaden the discussion here. I grew up with horses. They were my pals and horse show partners. During both training and recreational times, I was constantly awed by their intelligence and willingness to please. But it never occurred to me to experiment with teaching a horse anything resembling a human curriculum. As I think about practical horse behavior, beyond saddle and bridle, there’s no mistaking their brainpower, exhibited in even the subtlest of ways. Horses can be trained, they can be conditioned, and they can learn. Doc Key was quoted as saying, “I have always argued that if a mule in a cornfield can be taught what ‘gee’ and ‘haw’ means, that with patience and time that any animal can be taught a great deal more.” I believe that wholeheartedly. But, let’s be clear that horses learn with horse brains, not human brains. They do not speak our language or have human thought processes. They learn from us by observation, our own repetitive behaviors and requests, cause-and-effect actions, and reactions. Feeding a horse from the same bucket teaches them to identify that bucket. Housing a horse in the same stall does the same—they learn which stall is theirs. They know by sight what a saddle, syringe, or sweet treat means, and they learn that a rider’s or handler’s nudge with a leg, point of a finger, tension on the reins, all mean something. And, yes, horses learn voice commands easily. Perhaps most importantly to training, horses identify and react accordingly to people, based on how they are treated or have been treated in the past. They “read” voice inflections, a person’s moods, body language, and so much more! If you have a dog, a pet bird, or a resident gorilla, this might sound very familiar. Long ago, Dee Dee taught me these basic lessons especially well. Of all the horses I had the pleasure of growing up with, showing, and loving, Dee Dee was my soulmate horse. Go ahead and giggle. See, when I was a pre-teen and teen, this mare and I had such a deep connection, formed from spending so much time together, that my mother joked that a horse could read my mind. It was uncanny. Dee Dee and I were in sync in an exquisite, beautiful way that paid off in the show ring and in our mutual affection for each other. The nano-second that I would have a thought about moving one of her feet, or changing gaits or, whatever, Dee Dee made the change. In retrospect, I’m sure she knew my microscopic body language so well that she could predict my next move, sometimes before I had completed my thought. Likewise, I could read her moods and coming changes, though I think she was the more observant. The more we practiced any skill, the more in sync Dee Dee and I became. In a sense, we learned enough of each other’s language to get along brilliantly. As I began researching about Beautiful Jim Key, I couldn’t help but reflect on my years with Dee Dee, especially when I learned about the Clever Hans effect. Clever Hans was touted as an “educated” horse in Berlin in the first decade of the nineteenth century—Just as Doc and Beautiful Jim Key retired to Tennessee. 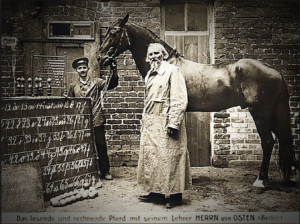 Owned by Wilhelm von Osten, Clever Hans exhibited many amazing feats similar to, though not as advanced as, Beautiful Jim Key. It was eventually declared that Clever Hans was reading subtle cues by his owner or by anyone with the correct answer to questions posed to him. Whether those cues were established by intentional training or through his owner’s subconscious body language is still in debate. Anyway, Clever Hans and von Osten were mostly (and perhaps unjustly) discredited at the time. 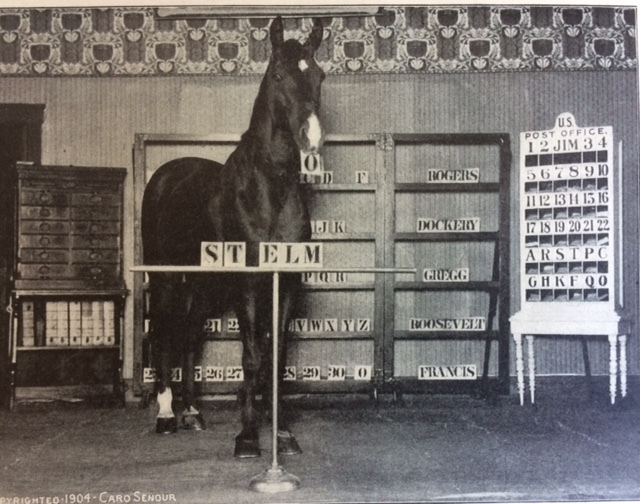 Today, there appears to be a push in the scientific community to return Clever Hans and his owner to a place of honor and respect. After all, even if Clever Hans was trained to notice these microscopic cues, doesn’t that itself indicate a tremendous intelligence? Is that any less remarkable? Need Proof of Nonhuman Intelligence? One doesn’t have to search far today to find research proving that animals are more intelligent than we ever knew. Need a few examples? There’s Koko, the lowland gorilla with a world famous sign language vocabulary that proves that she puts context to human words. There’s Alex, the African grey parrot who learned over one hundred vocal labels for objects, identified letters, and calculated small sums. On the horse front, there’s Lukas, the rescued thoroughbred who identifies numbers, letters, and colors, and who is calculating simple math. There are plenty more available studies proving that horses can learn to communicate with their handlers in different ways. Here’s one from Applied Animal Behavior, and one about horse memory. And here’s one from Horse Channel about horses learning to communicate their preference for blankets in varying weather conditions. 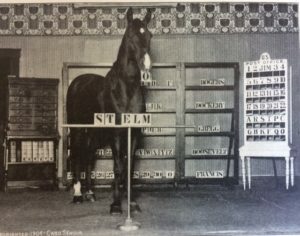 And here’s an Equus article about horses’ math abilities. And, take the time to watch this Rick Lamb video interview with Mim Eichler Rivas, author of the only adult book about Doc and Jim titled Beautiful Jim Key: The Lost History of a Horse and a Man Who Changed the World—considered the only scholarly source—the end of which includes additional information about scientific studies. Also, check out the Equine Research Foundation and their mega-list of articles related to horse behavior and intelligence. I hope Step Right Up will inspire you to explore the exciting research being conducted on nonhuman intelligence. Be wowed and impressed. Though nonhuman intelligence does not equate to human thought processes, I think you’ll agree that people have underestimated our fellow creatures. So, back to Beautiful Jim Key. I tackled the countless newspaper accounts about BJK with the aim of finding the gotcha. Surely, someone caught Doc giving signals or cues, right? 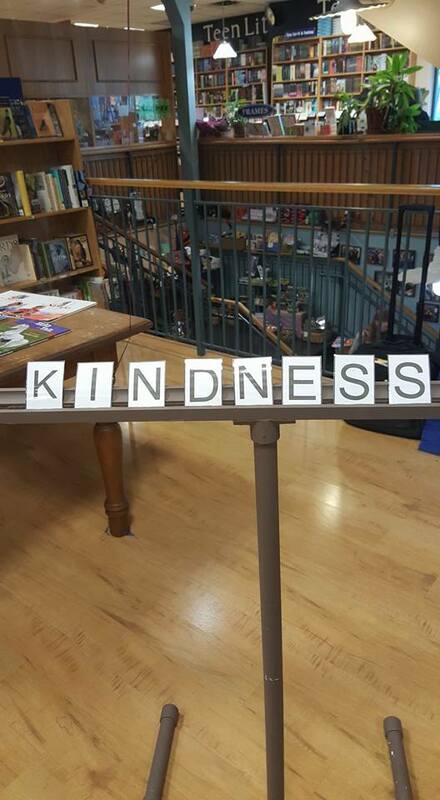 The fact that Jim Key accurately responded to spelling, math, identification of words, colors, playing cards, instructions, and other directives was proven again and again in different states and with different audiences. For nine years, the horse showed off these skills in front of millions of people, yet I have not found a single documented account that pointed to trickery. (I chose to ignore the two claims that Doc must have hypnotized the horse.) Usually, Doc was on stage with Jim Key, but sometimes a groom had to stand in. And there are accounts of reporters demanding to test the horse with nobody else in the room. Though Doc explained some of his training methods, like how he taught Jim to retrieve a silver dollar from a bucket of water without drinking a drop, and how to identify letters by associating verbal representation with marked cards and a healthy dose of sweet rewards, there’s a whole heap we don’t know about how Jim learned, or was conditioned, or was trained. Is it possible that the Clever Hans Effect was in play? Might Jim have been reading Doc’s subtle body language and microscopic cues—whether intentionally given or not? I think Yes! At the very least, Doc and Jim were in sync the way Dee Dee and I were. Doc and Jim literally spent twenty years together. How could horse and man not become so in sync as to read each other? I believe that Beautiful Jim Key was the product of kind and patient treatment and that he absorbed his lessons or skills through a combination of what I’ll forevermore call the Dee Dee effect: repetition, conditioning, positive reinforcements, training, and his remarkable ability to read his beloved human. All of it! However Jim learned to do so many remarkable things, WOW, WOW, WOW! My particular narrative for Step Right Up is focused on Doc’s life, Jim’s performances, and the tremendous effect the duo had on the emerging humane-movement. But there are so many layers yet to be explored. In the Afterword of Step Right Up, I acknowledge that we still can’t explain many of Jim’s apparent skills. I hope there is enough questioning throughout my book to inspire all readers to consider it further. Ultimately, the hows of Jim’s “education” are not the most important part of the story. What is most profound is that the world likely became a kinder place—one animal at a time and one person at a time—because of Doc and Beautiful Jim Key. This is so interesting! Animals respond to love and kindness and are so amazing.